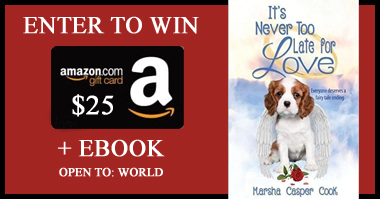 Enter to win a $25 Amazon Card and eBook from Marsha Casper Cook! Contest Comment Question: Have you ever found yourself talking to your dog waiting for an answer? Confirmed bachelor Noah Meyers thinks living his life without a wife is just fine and manages to dodge his meddling mother’s repeated attempts to fix him up. When an adorable dog named Gracie finds her way into his life and decides to play matchmaker, Noah finds his carefully constructed world is turned upside down. Will Gracie complete her mission to finally find a fairy tale happy ending for Noah and ultimately help herself find happiness too? It’s Never Too Late For Love is a timeless and delightful love story filled with a lot of laughter and just a hint of magic. This giveaway is now over. The winner has been posted in the comments.